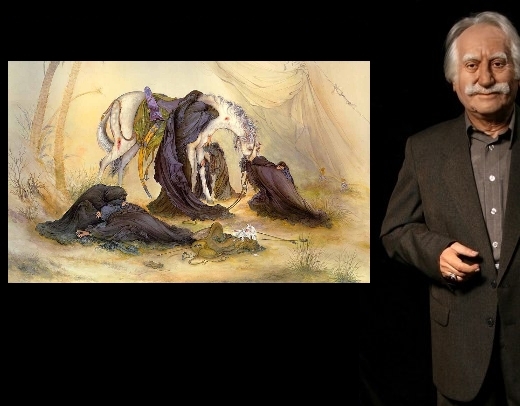 Mahmoud Farshchian, a household name in Iranian painting, says nationality plays no role in the way people treat arts. You are among the most popular artists in Iran and well-known in the world. For years, people of all ages, from children to the elderly, have related to your works, no matter in which divine faith they believe, from Abrahamic religions to Zoroastrianism to Buddhism. The spiritual chemistry and strong mental bond between people and your works is the reason why your paintings have been put on display in special places such as the International Space Station (ISS). Don’t you think you works are inspirational? What about death? Does Master Farshchian think about death? Have you completed any new work of arts? Yes. My latest works are “Adam and Eve” and “Guidance”. To create the former, I studied the holy Koran, the Torah and the Bible. I have talked to some of my friends who are Zoroastrian priests, read the Old and New Testament, and reviewed the beliefs of Buddhists. They all agree on this: Satan gives the Forbidden Fruit to Eve who makes Adam eat it. Islam is the only religion which believes Adam and Eve have done it together. Never does Islam put man before woman or the reverse, rather, the Muslim faith views the two as equals. Have you ever sold your works in auctions? Do you follow Iran’s news when you are not in Iran? Has any research institute or laboratory tried to carry out tests on your works, in terms of their durability, to preserve them for posterity? Have you been given any estimates on that? Yes. That is a very good question. I was recently contacted by researchers from the US. I was let in on the research results on my paintings. I was told their equipment has estimated that my works would stay intact for 600 years. It can be longer than that, but they can’t estimate beyond 600 years because that’s the maximum their machinery can estimate. Today traditional arts are being taught in Iran’s universities, but it is unclear whether those programs are intended to train artists or theoreticians. Where do you stand on that? Are you satisfied with the trend of training in Iran’s universities? Many of these programs can be pursued in postgraduate levels but the graduates are unable to even draw a line! I want to give a piece of good news to the art community. Since the pre-revolution period, […] I have asked all those who could do something to help set up an Iranian art university, I mean a university which could train real masters. Let’s rekindle past memories. Tell us about how “The Evening of Ashura” was created. Three years before the revolution, my mother told me on Ashura to go listen to Rowzeh-Khani [eulogies in honor of Imam Hussein, Prophet Muhammad’s grandson]. I said I had something else to do and I would go there later. I went to my room, but had a sad feeling. I felt a strange feeling. I took the paintbrush and started to paint “The Evening of Ashura”. Now when I look back at it after thirty-something years, I admit that the result would be the same if I wanted to do it today. There is something in this painting which brings tears to my eyes. Imagism is not part of the painting. 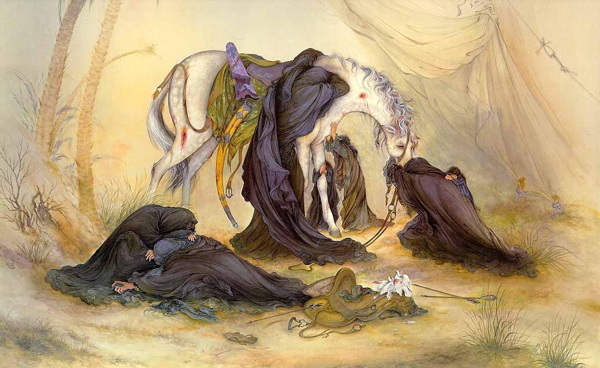 Imam Hussein (Peace Be upon Him), who is the main theme of the painting, is not seen in it. As for the content, I should say that this image owes its attraction to the absence of the leading character, Imam Hossein (PBUH). Looking at this picture, viewers look for the main character who has been central to the event – Ashura – as it unfolded. Tears welled up in the horse’s eye, the mortification the animal is filled with for carrying bad news, and the birds which have the blood of the martyr on their feathers are in fact messengers of a real tragedy. You’ve been living abroad for a while. How do you assess the take of people around the world on Iran’s national and Islamic art? Efforts should be made to familiarize people around the world with Iranian paintings. In that case, those paintings could be attractive enough to be watched by people, and when reviewed, their content would stay in people’s minds.